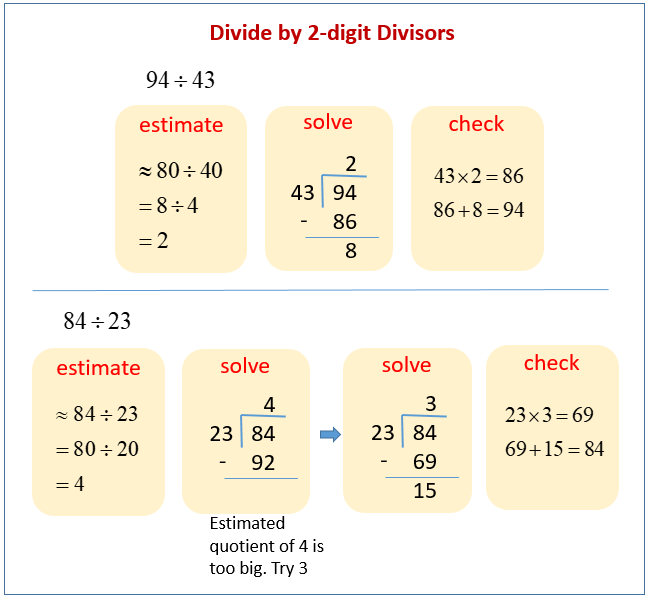 Videos to help Grade 5 students learn how to divide two- and three-digit dividends by two-digit divisors with single-digit quotients and make connections to a written method. The following example shows how to divide a three-digit dividend by a two-digit divisor. Scroll down the page for more examples and solutions. Billy has 2.4 m of ribbon for crafts. He wants to share it evenly with 12 friends. How many centimeters of ribbon would 7 friends get? Note: This application problem reaches back to concepts taught in G5–M1. 1. Divide, then check with multiplication. 2. When dividing 82 by 43, Linda estimated the quotient to be 2. Examine Linda's work and explain what she needs to do next. On the right, show how you would solve the problem. 3. A number divided by 43 has a quotient of 3 with 28 as a remainder. Find the number. Show your work. 4. Write another division problem that has a quotient of 3 and a remainder of 28. 5. Mrs. Silverstein sold 91 cupcakes at a food fair. The cupcakes were sold in boxes of "a baker's dozen," which is 13. She sold all the cupcakes at $15 per box. How much money did she receive? This video demonstrates how to divide with two-digit divisors. The process includes an estimate, a solution, and a check. 2. A 189-square-foot rectangular office has a length of 21 feet. What is the width of the office? 3. While preparing for a morning conference, Principal Corsetti is laying out 15 dozen bagels on square plates. Each plate can hold 14 bagels. a. How many plates of bagels will Mr. Corsetti have? b. How many more bagels would be needed to fill the final plate with bagels? 2. A 91-square-foot bathroom has a length of 13 feet. What is the width of the bathroom? 3. While preparing for a morning conference, Principal Corsetti is laying out 8 dozen bagels on square plates. Each plate can hold 14 bagels.